Custom Tile, Custom Home Decor, Custom Tile Floors, Custom Tile Murals, Custom Art Gifts, Custom Furniture-We Can Design From Scratch. 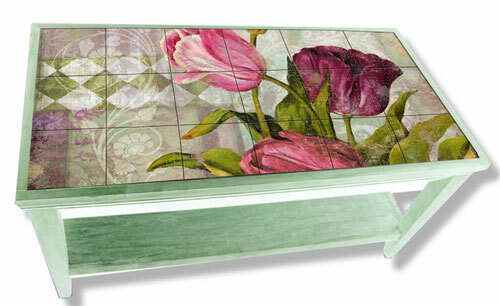 Imagine a glass, ceramic or porcelain tile floor, totally customized with art exclusively created for you and your home. Imagine a kitchen backsplash or tile mural for any room in your house made your dream artwork, envisioned by you, coming to life on tile. Imagine matching your new tile murals or floors with accent pieces like serving trays, coasters, clocks or table linens, giving your home a rich, designer look. Imagine having a licensed, professional artist and designer personally assisting you as you design your kitchen, bathroom or any other room with custom tile, working closely with you for the look you want. We can do that, and a lot more. And here's something else--nobody else in the world can do what we do. That's a fact. No matter what you can imagine, from collage to abstract art to dreamscape to landscape to country art, ethnic art, religious art, inspirational art, new age art, still life, seascape, impressionist art, vintage, nouveau, deco, retro, photography, pop art, collage, portraiture, pattern design, and more, we can work with you to bring your vision to life on tile (glass, ceramic or stone) as well as our many other customized art home decor products. Your colors, your taste, your vision, your dream can become a reality. We will design your artwork from scratch and you will be able to own an exclusive, one-of-a-kind tile mural (or any other product) that faithfully reflects your personality, taste and flair. We can even recolor/enhance/adapt existing art. Let us be clear: this is not "clip art" (pre-made work) but painstakingly designed custom artwork. Once the art is created, we can print it on any product you desire. Each project is individual and unique, so please contact us for an estimate on your project. Below are two examples of very recent custom commissions for clients with two very different visions and requirements. The first image, the flying ostrich, was created as a memorial tile for the family who tragically lost a young daughter. 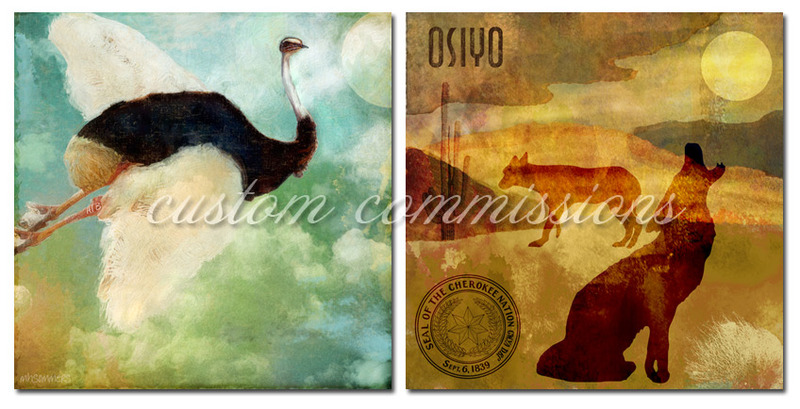 This young lady believed ostriches could fly, so a flying ostrich visual was requested to represent an uplifting testimonial to her. I was asked to create a flying ostrich with an ethereal flavor, and the client was thrilled with the result. The second image of the wolves was requested by an important member of The Cherokee Nation for one of two custom tile floors. In this case, too, the client made not one change and was thrilled with the result. Interior Design Ideas and Intensely Personalized Home Decor Guidance. Tell us about your space/show us photos of your space and we will work closely with you to create a transformative tile mural, accent or border tile or backsplash that can coordinate with custom designed tile murals, accent tiles and home decor accent products. Custom designed backsplash and coordinated accent tile. Click for larger image. Custom Fabric or Pattern Matching. Whether you want glass, ceramic or porcelain, we can design a stunning custom tile floor. 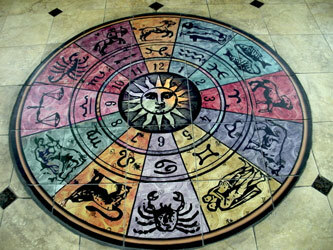 Click here to see our floor tile shopping page. 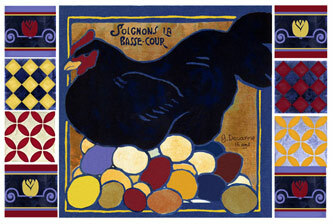 Large-Scale Commercial Tile Murals for Boardrooms, Lobbies, Bars, Restaurants and More. Color Bakery has created large-scale murals for boardrooms, bars, restaurants and corporate lobbies and greeting centers/reception areas across the United States. Our expertise in imaging, printing and professional quality design has enabled us to lead the pack when it comes to tile mural commercial projects. For companies who have specific or even unusually demanding requirements--whether it's custom design or photography--we have unprecedented design capability and a huge archive of photography and artwork that can be adapted to your specific needs. Whether it's taking your corporate photography and melding it with your logo in an exclusive collage, or designing an art piece around your corporate brand, we can help. Contact us to learn more. Not only can we make custom tile furniture with any piece of art you like, we will custom grout and stain it for you. Click here for our furniture selection. Custom Printing: Your Art/Photography on our Products. If you would like to print your art or photography on our products, click here to learn more. Getting It Printing-Ready: General Scanning and Enlargement Services. Taking a lower resolution image and enlarging it safely for large-scale printing is more than a skill, it's an artform. One cannot merely blow up the image in a digital art program and call it high resolution, when it is not. When you do this, the computer creates data where none exists to achieve the larger size; this is called interpolation, or "making stuff up from nothing." The end result is blurred, pixelated and lacking in definition. As we mentioned in the paragraph above, Color Bakery refuses to sell substandard products. To get images ready for printing the right way can, at times, be extremely labor intensive. We work with both individuals and companies, taking their art or photography and readying it for professional printing--whether or not we do the printing for them. In fact, we've even assisted other tile mural companies with their own image retouching and enlargement challenges. We also offer scanning services. Contact us to learn more. Send us your photo--portrait, your children's art, landscape, skyscape, seascape, still life, floral, architectural shot, vacation photo, cityscape, art photo, pet--and we can take it and transform it into a beautiful art painting or a digital collage or portrait--digital watercolor, pop art, oils, and more. We can then take that art and print it on tile: glass, ceramic, tumbled marble...not to mention our many other products. Whether you like photo realism, watercolor, pastel, oil, you will be thrilled and amazed by what we can create from any treasured photograph. Your photo on a custom background-photo or painting. How about your son or daughter sitting in a field of daisies? Your cat or dog in front of a fireplace or Christmas tree? We can do it, and we can also make the photo into a custom digital painting. Cats as cherubs in Michelangelo's "The Creation of Man"? Yes, it can be done. We can manipulate art and photography to make your visions and dreams come alive. No matter how unusual or complicated, we're up to the challenge. Contact us with your ideas. We have a huge archive of fine photography and art. We challenge you to send us a request, because we are confident that we have exactly what you are looking for. No matter how odd, unusual or unique, we think we can help. We have a huge database of the highest quality photography and fine Western and Eastern art by the masters, not to mention patterns, backgrounds, textures and more. Whether it's a lion in a jungle or a corporate business shot or a stunning seascape, a Van Gogh, DaVinci or Klimt, a turn of the century French Bicycle poster or vintage art nouveau advertisement, we have what you need. The fact is, if by very small chance we don't have what you're looking for, we might be able to create it for you. Note: a search fee may apply. Contact us. Image/Photo Retouching, Enhancing, Recoloring and Restoration. Color Bakery can take your old, damaged, torn and/or discolored photos and bring them back to life and make them printing-ready. Similarly, we can also take your photos and "glamorize" them with various retouching and enhancing techniques. Contact us to learn more. Services for Our Resellers/Wholesale Customers. When you purchase Color Bakery products for your store, gallery or website, you're not just getting one of a kind quality art products...you're getting a company who literally partners with you to help you grow your business. As an example, we can take your logo and use it in tandem with the artwork for product printing. If you have a store in a tourist area, we can include a beautiful font treatment for custom text on the image, such as "Martha's Vineyard" or "Virginia Beach". Gift and New Age stores can blend the artwork with inspirational affirmations and sayings, as we can design a whole custom line of stunning home decor accent, gift and ar products that is exclusive to your store. Additional services include product photography so you can display and sell your Color Bakery products online, logo and web design, and more. Contact us to learn more.